This Sea of Cortez cruise around the most exquisite Baja Peninsula in Mexico is a naturalist’s nirvana, particularly if whale watching is something that you have always dreamed of. Baja California, to give its full name, is the second longest peninsula in the world, at over 1,200km in length and this small ship cruise explores the southern and eastern side of it, in a region known as Baja California Sur. This is where all the wildlife action takes place and this island-hopping adventure takes you into a world of sea turtles, boobies, pelicans, frigate birds, blue whales, grey whales, orca, humpback, pilot and fin whales, whale sharks, dolphins, mantas, and sea lions. 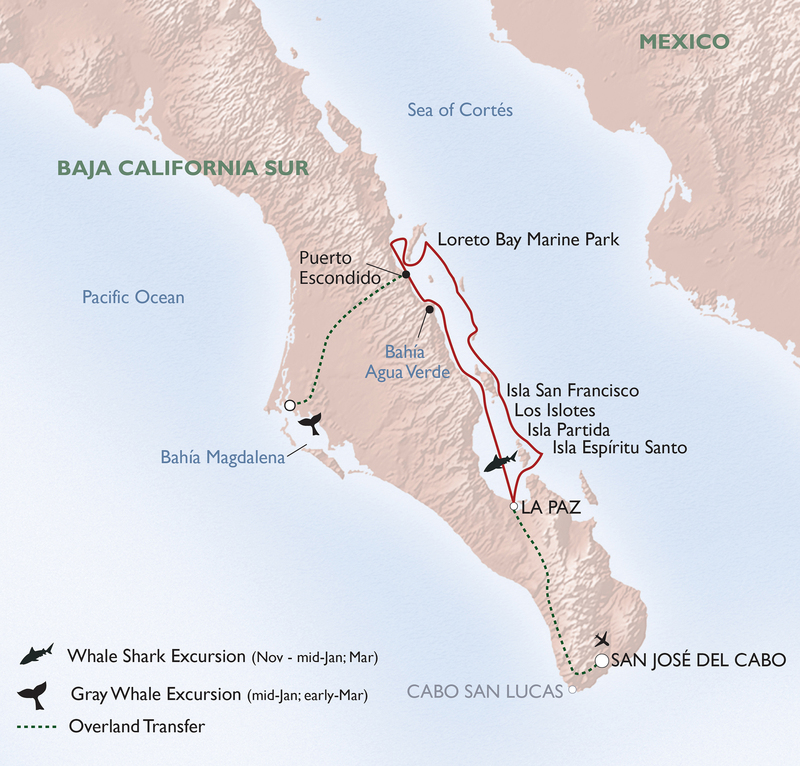 Grey whales, in particular, are a big attraction here because Baja is famous for its prolific numbers, coming to Sea of Cortez to mate and clustering in sheltered lagoons. As well as whale watching there are plenty of other wildlife watching experiences to be had, and other adventures too. These include kayaking in coastal mangroves, snorkelling in crystal clear coves, heading onto land to hike through coastal desert terrain, and visit traditional Mexican villages home to ‘sudcalifornianos’. Or just chilling out on one of many white sandy beaches. Because this is a small cruise ship, we are able to access small coves that Mexico’s giant cruise ships can’t get to. Here we can make the most of the ship’s equipment, all of which appeal to the adventurers within. Such as kayaks, paddle boards, inflatable skiffs, yoga mats, snorkelling equipment, wetsuits, hydrophone and bow-mounted underwater camera. Then for chilling out in the evening we have two hot tubs, sauna, gym equipment and a massage room. All cabins are ensuite, have TV’s and air conditioning. The vessels operators have been recognised by the The Passenger Vessel Association as a member of its Green WATERS Program for the company’s dedication and commitment toward a cleaner, greener marine environment. Members of WATERS (We Are Taking Environmental Responsibility/Stewardship) members from around the U.S. have taken it upon themselves to reduce their environmental impact in a variety of ways, including reducing fuel consumption, conserving potable water, using less harmful chemicals near waterways, conserving energy, and working with their employees to create a greener workplace. The PVA Green WATERS Program was designed exclusively for the passenger vessel industry as a voluntary program aimed at reducing waste and operating in a cleaner, greener, more sustainable environment. Our ships operators follow 'Leave No Trace' practices on all voyages and explores remote areas in small groups to minimize impact on the environment. In the operators offices and aboard ships, eco-friendly products are purchased; waste is reduced through purchasing decisions; communities are supported through local purchases, hiring and donations; and recycling occurs wherever there are facilities. Vessels are maintained with an eye on fuel reduction including choosing more efficient engines. A new partnership with Monterey Bay Aquarium’s Seafood Watch program reinforces the line’s commitment to only serve sustainable seafood. The vessels operators are very tuned in to responsible tourism. As part of operating a responsible business they ensure that they make a positive impact in the communities they visit around Mexico. This core value is part of their initial itinerary planning on through to operations, management and office practices. Whether it’s a cruise donation to an organization, a fundraising effort or partnering with local companies for tours, they look for ways to share the wealth and enrich the lives of those we meet. We encourage all our passengers to engage with the local community on a social and economic level to ensure that this tourism has a benefit to both the visitors and the hosts. The ship’s managers will buy as much of their produce as possible from local communities, and will also encourage our passengers to spend money in the communities that we visit. For example by trying some local fruit juice instead of a well known American brand of soft drink, you will support the economy, it will be better for you and who knows, you might find you enjoy it more too. We will endeavour to maximise the benefits of tourism and to minimise or eradicate any downside, socially, environmentally & economically. We will encourage our passengers to learn and understand as much as possible about the local traditions and way of life in Mexico to enable them to appreciate the reality of life in this region. Most produce on the boat locally sourced. Tour guides have environmental care. V enjoyable. A lot of elderly Americans on board. Captain over-cautious re wind which meant first two days/nights spent anchored and itinerary suffered as a result.